Providing World-Class Service to the Marine Industry. We are staffed professional marine surveyors, consultants, appraisers and adjusters who are NAMS Certified. Diers and Stark, Inc. strives to be one of the world’s leading marine surveying companies by providing immediate response to all request for marine surveying services combined with fast and accurate reports detailing our unbiased finding and recommendations to all of our clients. We work closely with our clients to develop an understanding of their particular needs. Diers and Stark, Inc. has over 100 years of combined experience that enables us to handle any conceivable job associated with marine surveying. Our primary asset is our team of experienced surveyors, consultants and support staff. Harry Stark and our staff surveyors come from a wide range of marine surveying underwriting and engineering backgrounds and are supported by a knowledgeable, efficient administrative staff. Diers and Stark, Inc. and staff surveyors are NAMS certified and accredited. The NAMS certification ensures that you will be provided with the highest Quality Marine Surveying Services. Harry Stark and the staff surveyors have underscored their commitment to the marine industry through the establishment of Diers and Stark, Inc. marine surveyors, consultants, appraisers and adjusters. 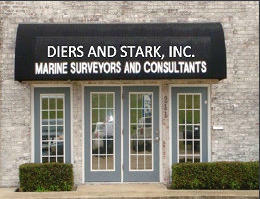 Diers and Stark, Inc. corporate office is based in Port Arthur, Texas with a dedicated staff of marine surveyors strategically located on the Gulf Coast. This enhances our company’s ability to meet all of your marine surveying needs by providing fast accurate unbiased reporting and consultation services. Additionally, Diers and Stark, Inc. carries comprehensive general and marine liability insurance and is therefore able to enter all refineries and shipyards. Diers and Stark, Inc. offers a wide range of marine surveying performed by an experienced NAMS certified team. We offer detailed and accurate reports provided in a timely fashion suited to your needs. All surveys consist of thorough physical and visual examination with all conditions documented with detailed survey notes and high resolution photographs to ascertain the status of the vessel. You can rest assured that with our team of accomplished surveyors and staff you will be provided with the highest quality of marine surveying service in the industry. As members of the National Association of Marine Surveyors, Certified Marine Surveyors (NAMS-CMS), we are committed to the highest standards of quality and total accountability in every facet of our surveying and consulting services. • Cargo Load & Secure • On & Off Charter • Engine & Marine Gear Failure Analysis • Loss Prevention • New Vessel Construction Attendance • Shipyard Repair Specification & Supervision • Dock Builders Risk • Hull Audio Gauging • Salvage Attendance • Cargo Disposal • Expert Witness (Curriculum Vitae & Previous Court Case Listing upon request) • Mediation Attendance • AWO Responsible Carrier Program Audits • American Chemistry Council Responsible Care Audits • Collaborative Naval Architect Services with Arthur Darden Inc.
consistent, reliable marine surveying and consulting services throughout the United Stated of America and abroad. Interested in our services? Get in touch with us via email and we will get back to you as soon as possible. Load & Secure, Heavy Lift, Condition & Evaluations, U.S. Army Corp of Engineers Condition Suitability & Valuation, Appraisals, Trip & Tow and more. New Barge Construction, Audio Gauging, Draft Survey, Oil Spill Attendance, Cargo Load & Secure and more.